Loads of fresh E17 kale! I did my first food swap this week with someone that I’d never met before. Armed with a warm loaf of bread, a bunch of homegrown herbs and a bag of dried chillies we arranged to meet at The Bell. In return, I got a massive bag of kale and other lovelies including gooseberries, artichoke, squash, baby marrow, potatoes and a courgette. Plus the real bonus was meeting Joanne who has an allotment in Walthamstow. That night I made a quick gooseberry fridge jam which married well with the loaf I’d made for us. I also decided to make healthy crisps with my stash of kale. Wash the kale, remove any really thick stems and dry the leaves. Put the kale onto a baking tray in a single layer. 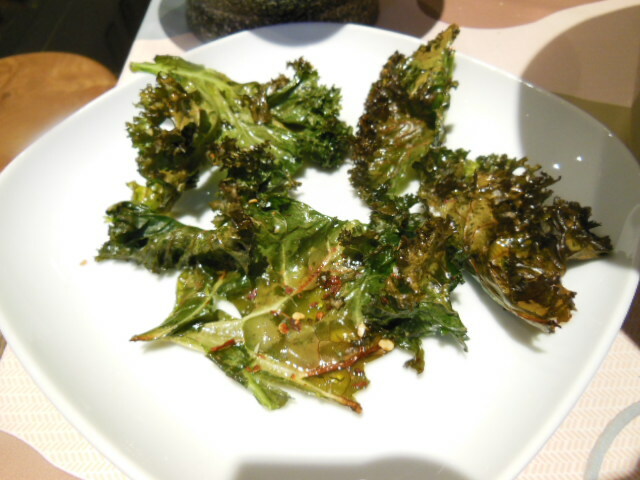 Spray with veggie/rapeseed oil – don’t pour your oil onto the kale otherwise it gets too oily. Bake in a hot oven – 220 degrees. After 5 minutes check with a spoon that the leaves are not sticking to one another, then back in the oven for another 7 minutes. Season with – well choice is yours – Turkish chilli flakes, sea salt, paprika, black pepper or even sugar. Get the next batch ready and into the oven – they’ll disappear fast! They’re a bit like crispy fried seaweed from the take-away, really more-ish and a healthy nibble with a drink. E17 food swapping is great – who wants to join in? I’m offering homemade bread! I set up a twitter account just to kick it off! This entry was posted in Recipes and tagged allotment, E17 food swap, food swap, glut, Kale, kale crisps, Walthamstow. Bookmark the permalink.